The story of the invention of Coca Cola is not well known, considering the huge popularity of the drink. 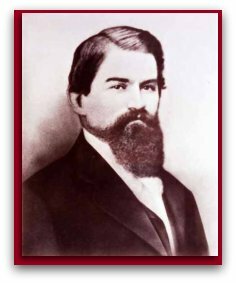 Not many people will recognise the name of John Pemberton, the inventor of Coca Cola. John Pemberton lived in Columbus Georgia, in the late nineteenth century. He was a chemist and a pharmacist by profession. In April 1865, Pemberton, was wounded in the battle of Columbus Georgia during the American civil war, fighting for the confederate states army. The invention of Coca Cola was a direct result of his misfortune during that fight. At the time, Morphine was a popular medicine used to help alleviate the suffering of wounded soldiers and dull the pain of war wounds. Like many other veterans of the period, Pemberton got addicted to the drug. Morphine addiction was so prevalent after the American civil war that it was often known as "the army disease." Faced with his own addiction and that of many of his fellow war veterans, Pemberton used his vocation to try and find a cure for the addiction. As a chemist and pharmacist he was familiar with the touted benefits of Cocaine which was very popular in the late 19th century as a mental stimulant. The drug was known to increases alertness, create feelings of well-being and perceived euphoria, induce a sense of energy and improve motor activity. Sigmund Freud recommended the use of Cocaine in 1884 as a cure for treating addiction, such as alcohol or morphine addictions. 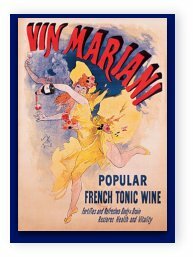 In 1865, the year Pemberton was wounded at war, a healing medicinal drink called Vin Mariani, a mixture of wine and cocaine, was introduced to the public and became a popular cure all solution. The drink was made of Bordeaux wine, treated with coca leaves. It was claimed that drink can restore strength, energy and vitality. Pemberton’s experiments to try and find a cure for Morphine addiction have led him to create his own version of coca wine, which he called Pemberton's French Wine Coca. His version was an alcoholic drink, mixed with coca (the plant from which the chemical cocaine is extracted), a cola nut (the nut of the Cola tree, a tree related to the cocoa family, whose nuts contain caffeine) and Damiana ( a shrub native to Texas with known relaxing and libido enhancing effects). Pemberton’s French Wine Coca, is the original alcoholic version of the invention of Coca Cola. It was advertised to have a particular benefit to high strung southern Ladies and anyone requiring a nerve tonic. In 1886 with the introduction of temperance legislation in Atlanta and Fulton county, limiting and restricting the sale and consumption of alcoholic beverages, Pemberton was forced to come up with a non alcoholic version of his French wine Coca, leading the invention of Coca Cola. With the help of a fellow druggist from Atlanta, Willis Venable, he tested and perfected the recipe for the beverage, using several attempts, through a system of trial and error. Pemberton worked out a set of directions for the preparation of the drink, including blending the base syrup with carbonated water, which at the time were considered beneficial to a person’s health. 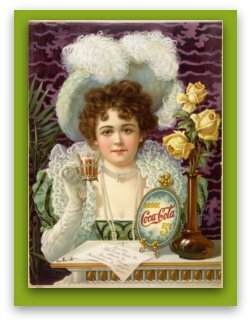 The invention of Coca – Cola, was originally sold as a patent medicine, a term we use today to describe medical concoctions whose effectiveness is unknown,that were historically sold under a variety of names and labels. The original Coca Cola was sold for 5 cents a glass and could be found at soda fountains, popular in the US for the water's supposed health qualities. They were an attempt to replicate mineral water that bubbled from the earth. Who could have imagined that the invention of Coca Cola, a concoction aimed as a medicinal tonic, and formulated with carbonated water to add to its health promoting qualities, will end up becoming one of the most famous fuzzy beverages world wide.